Old (Framed $49,size 11X14 - Unframed $29 ( approx 9"X12"
Victorian Unidentified 1908 team B. 1918 Black Team in Dog Ear Helmets C.
1920's color Football Illustration Poster D.
1930s Sheet Music "Forward Pass" F.
College football Cover Mich. 1940's G.
1920 Unidentified team on Field H.
Potsy Clark Football Cover J. 18" X 24" litho Poster by illustrator Ron Mazellan K.
1920 Cover Salesman's News L.
1920 Black Team posed on School grounds N.
1908 Baylor Football Team Y. 1880-1890 Nose Guard "No Helmet" Team Z.
Click here to see all of the framed photos that we carry. Football historians, those who have studied the game and its origins, place the games beginnings in rugby, an English game played with many similarities to football. 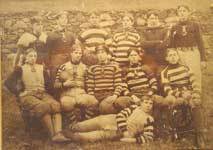 Rugby began in eighteen twenty-three at the famous Rugby Boys School in England. Another cousin of the game of football is soccer, sometimes called association football; its beginnings can also be traced to English origin, being played as early as the eighteen twenties.COLLEGE FOOTBALL: ITS BEGINNINGSAt the same time, a group of students, who did not wear leather football helmets,at Princeton began playing what was then known as ballown. First using their fists to advance the ball, and then their feet, this game consisted mainly of one goal: to advance the old watermeoln football past the opposing team. 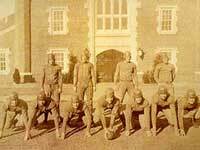 There were no hard and fast rules applied to this earliest attempt at the game we now call football.At Harvard, the freshman and sophomore classes, who also did not at first wear leather football helmets, competed in a football-type game, played on the first Monday of each school year; this event came to be known as Bloody Monday because of the roughness of the game. Pick up games,where there were no leather football helmets, similar in style to that played on Bloody Monday, soon became popular on the Boston Common, catching on in popularity around eighteen sixty.Soon after the end of the American Civil War,still the leather football helmet had not been invented, around eighteen sixty five, colleges began organizing football games.None of these early teams wore leather football helmets. In eighteen sixty seven, Princeton led the way in establishing some rudimentary rules of the game.But still , leather football helmets were not used or invented. Players simply tied a bandana around their heads. Also in that year, the football itself was patented for the very first time That early ball was a crude watermelon, almost round shape. But still no way to protect the players from death or concussins because there were no leather football helmets even thought of during these early years..Rutgers College also established a set of rules in eighteen sixty seven, and with the relatively short distance between it and Princeton, a game was decided upon by both universities. 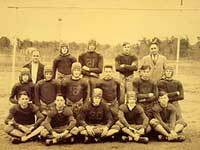 A date was chosen, November sixth, eighteen sixty nine; Rutgers won by a score of six goals to four, and thus was played what has become known as the very first intercollegiate football game No leather football helmets were worn during this contest. 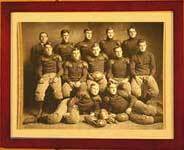 The flying wedge plays injured many because they had no leather football helmets..In eighteen seventy three, representatives from Columbia, Rutgers, Princeton, and Yale met in New York City to formulate the first intercollegiate football rules for the increasingly popular game, still being played with many of the rules of soccer. 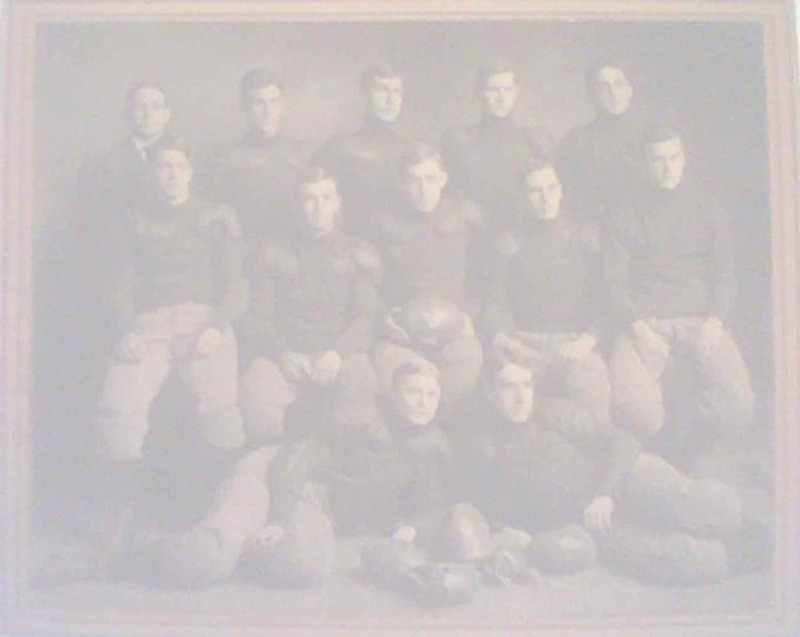 These four teams established the Intercollegiate Football Association, and set as fifteen the number of players allowed on each team.Walter Camp, the coach at Yale and a dissenter from the IFA over his desire for an eleven man team, helped begin the final step in the evolution from rugby-style play to the modernfootball game of American football. The IFAs rules committee, led by Camp, soon cut the number of players from fifteen to eleven, and also instituted the size of the playing field, at one hundred ten yards. But still no one thought to protect themselves better with a leather footbal hemet. In eighteen eighty-two Camp also introduced the system of downs. After first allowing three attempts to advance the ball five yards, in nineteen six it was changed to ten yards. The fourth down was added in nineteen twelve. Tackling below the waist had been legalized in eighteen eighty-eight.Within a decade, concern over the increasing brutality of the game led to its ban by some colleges.Brutal plays that actually walked and trampled opposing players were the norm and leather football helmets still had not been invented to protect the head of the players of early football. Nearly one hundred eighty players had suffered serious injuries, and eighteen deaths had been reported from the brutal mass plays that had become common in practice. 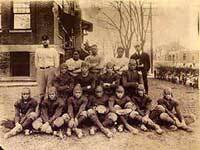 The earliest leather football helmets were invented by a Navy player in 1893. He asked a local blacksmith to improvise a leather harness hat to protect his head. As his doctor said that if he continued to play , one more kick to the head would kill or paralyze himfor life. Thus the first "leather football helmet was born. Soon other players created additional styles of leather football helmets to protect their heads and ears. Still the early leather football helmets provided littl protection. There were such styles as the early beehive leather football helmet, the flat-top leather football helmets and the dogear leather football helmt. 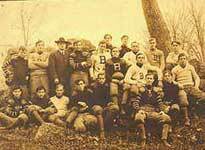 In nineteen hundred five, President Theodore Roosevelt called upon Harvard, Princeton, and Yale to help save the sport from demise.At a meeting between the schools, reform was agreed upon, and at a second meeting, attended by more than sixty other schools, the group appointed a seven member Rules Committee and set up what would later become known as the National Collegiate Athletic Association, or the NCAA.From this committee came the legalization of the forward pass, which resulted in a more open style of play on the field. The rough mass plays, which once caused so many serious injuries, and even deaths, were prohibited by the committee. Also prohibited was the locking of arms by teammates in an effort to clear the way for their ball carriers. Still many early teams wotre no leather football helmets. But eventually the advantages of the leather football helemt were seen . And soon one could watch a game and observe half the players with out leather football helmets and half with leather football helmets to protect their heads.The length of the game was shortened, from seventy to sixty minutes, and the neutral zone, which separates the teams by the length of the ball before each play begins, was also established. The earliest balls wree called watermelon footballs and they have become almost extinct along with the earliest leather football helmets . Today these leather football helmets can only be found in museums or among fine collections of leather foorball helmets. Today, almost one hundred years since the inception of the NCAA, the sport of college football flourishes as one of the most popular of collegiate games. Colleges and universities are placed into three divisions under NCAA guidelines and each division has many conferences. Seasonal and conference play leads to post-season bowl games, where the champions of conferences meet to play in front of a world-wide television audience. Some of these bowls include the Rose Bowl, played on New Years Day in Pasadena, California, between the Big Ten and Pacific Ten conference champions. Other bowls include the Orange Bowl in Miami, Florida, the Sugar Bowl in New Orleans, Louisiana, the Cotton Bowl in Dallas, Texas, and the Peach Bowl in Atlanta, Georgia. The leather football helmet evolution follows the great early college game as lether helmets first showed up in the 1890s and then the leather helmets gradually develeoped into a stronger and more protective piece of gear. .PROFESSIONAL FOOTBALL: ITS BEGINNINGSProfessional football was first played soon after the demise of the Intercollegiate Football Association, around eighteen ninety-five. 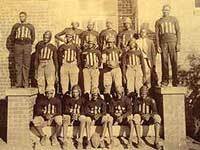 In nineteen twenty, the American Professional Football Association was formed; one year later it was reorganized and in nineteen twenty-two was renamed the National Football League Some of the great early Pro players who wore leather football helmets were Red Grange , Jim Thorpe, the early Packer team , the early Bear team , the early Giant team , the early Philadelphia team, and the early Pittsburgh team. Players wore varying style of leather football helmets . And the colors also began to show up on the early 40s leather football helmet s. Before that most helmets were plain natural leather either brown, cordovan , or black. Color leather football helmets allowed the quaterback to better see the receiver at long distances when he was far down the field. So more and more teams begab=n to paint their leather football helmets to put some visibility sizzel into their games. .Unlike the APFA, which handed out franchises far and wide with little discretion, the NFL, from nineteen forty-six to forty-nine, was limited to ten teams. Gradually in the late 1940s the leather football helmet began to be replaced by early plastics. However many of the early plastic football helmets shattered and caused injury. So. 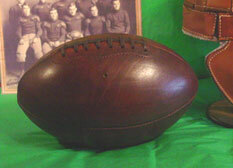 the leather football helme survived thru the World war II years and lingered into the early 1950s. But gradually the old leather football helmet was replaced by the plastics and more and more teams began to add logos and symbols to their helmets . the early leather football helmets were spared this clutter and reamined unadorned right into the 50s eara. Soon howevre the old leather football helmet faded into history. many pooreer high school teams and JR high teams still used these old leather helmets right into the 1960s and 70s . Today the leather football helmet is practically extinct and can only be found at museums or in fine collections.The APFA, on the other hand, consisted of twenty three teams in the year between its inception and the change-over in becoming the NFL.A merger in nineteen seventy, fifty years after the inception of the first pro football association, combined sixteen NFL teams with ten AFL teams to comprise one league with two conferences. In the nineteen eighties, further expansion was proposed and by the ninety three-ninety four NFL season, approval was given for a thirty-team league. The next step towards growth of the league would be to realign the NFL into eight different divisions, each with four teams.Pro football, like its college counterpart, was not without its failures. Among the number of competitive leagues that have folded in failure are the All-American Football conference, nineteen forty-six to forty-nine, the American Football League, nineteen sixty to sixty-nine, and the World Football League, nineteen seventy-four to seventy-five.Arena Football, an indoor league played in the spring with eight man teams, debuted in nineteen eighty-seven. It is still played, but does not enjoy the popularity or success that is found in the National Football League.PROFESSIONAL FOOTBALL TODAY: A BUSINESSFrom its humble beginnings in eighteen sixty-nine, when the first intercollegiate game was played between Rutgers and Princeton, football has become a multi-billion dollar business in its professional form.Once watched by no more than a handful of loyal sideline enthusiasts, football is now available for worldwide viewing. With the advent of cable television, dozens of high school and college games can be watched over Friday and Saturday afternoons. Pro games are televised on Sunday and Monday nights, with at least half a dozen games televised each weekend during the season. At the end of each NFL season, champs from both the National and American conferences meet in the Super Bowl to determine a national champion. This game, always played in January, has been called the most watched sporting event of all time, with a viewing audience from around the entire globe, watching and listening to the televise in dozens of languages.Although television commercials foot a very large part of the bill, the competition between networks for the coverage rights highly inflates the value of NFL franchises. In nineteen twenty, a franchise cost one hundred dollars. By nineteen sixty, each was worth approximately two million dollars. In nineteen ninety three, when the league decided to expand, selling teams to Charlotte, North Carolina and Jacksonville, Florida, the cost rose to one hundred forty millions dollars per franchise.In the same year, the NFL signed a five-network, four year television contract, totaling almost four and a half billion dollars.Some may say that if cheerleading was truly a sport then it would have been included with other sports long ago. He will frequently use the word draw here for lack of a more precise term to refer to the use of graphics software. All bodies will rotate easiest about their center of mass. In the year 2000, the popularity of arena football led to the formation of arena football 2, an expansion league. The ancient egyptians swam, raced, wrestled, and played games with balls. Pass patterns are the routes the receivers run downfield after the snap of the ball.The rare kinds and styles of leather football helmets worn by college and Pro teams can still be seen at their resoective college campus museums , at the College football hall of Fame Museum and or the Pro Football hall of Fame Museum in Canton Ohio. Trap block: when a player is allowed through the enemy line only to be blocked by surprise from another player behind the line. Suicide squad: see special teams. Like the offense, the defense does not want to make its intentions obvious, especially when the coach calls for an aggressive defense such as a blitz a charge against the quarterback. So, there are different shoes here, sorted by style and bottom. Some teams use a 3-4 defense, with three defensive lineman, four linebackers, and four defensive backs. The officials then place the ball at the point where the team has ended up. For example, our running back would have the following momentum p: p = mv = 98 kg9. Many players apply two-sided carpet tape to their shoulder pads so that the jersey sticks to the pads! The winner of this game is crowned the national champion. He also considers the strengths and weaknesses of the defense. Role model - cheerleaders are looked up to by their peers. Today many sports history enthusisasts look for old leather football helmets for their collections or to offer as awards or commemoratives. These olfd battle helmets, the leather football helmet, will always represent the great history and evolution of the game itself.